As we wrap up Audiogon’s Vintage month, we wanted to take the time to appreciate user Maize10‘s Lafayette/Goodman SK111 restoration project. If you’re into great Vintage sound and gorgeous Art Deco design, this should give you goosebumps! We got in touch with Maize10, or Kevin Manz as he’s known locally, to find out how he began his relationship with high-end sound and what led to his obsession with audio restoration. AUDIOGON: In your opinion, what is the difference between a casual music lover and a true audiophile? KEVIN MANZ: Listening, as we know, is very subjective. I think the casual listener/music lover can listen to almost anything on almost anything. I think the audiophile has has narrowed this down like the wine connossiuer starting with less expensive options and developing their tastes to more refined choices and recognizing the differences between them. The audiophile will hear these differences but still have an appreciation for the individual offerings from different systems, vintage or new. A: What was the first restoration project you tackled? 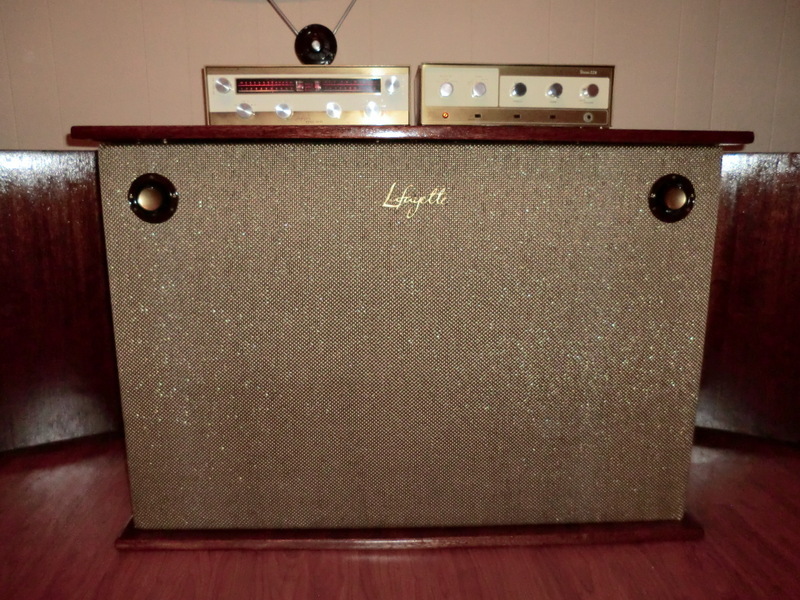 KM: My first restoration was a pair of 1954 JBL’s with the 001 system in Barzilay cabinets and this hooked me on vintage but I moved on to L250’s on a Luxman L-560. I still don’t have anything newer than 1986. This seems to be the system I will keep but I continue to change out my other systems as projects come in. It gives me an opportunity to hear a lot of different speakers and components that I would normally not purchase myself. A: What’s your day job? If you could have any job in the world other than your own, what would it be? KM: I work at Room and Board Furniture in the Merchandise Quality Department. My dream job would be to do Audio restoration full time. A: What are your favorite recordings? KM: I grew up with friends who were all into music and fans of many styles. I grew up in the Post Punk and New Wave era and still enjoy that music. I listen to a variety of older jazz musicians and really enjoy Billy Holiday and new artists like Patricia Barber. Great recording on good equipment can have me listening to almost anything. KM: A dream audio evening would have to put me back in time with some recording engineers and some artists from the 50’s cutting an album. A: How did you get into Vintage restoration? KM: I started refinishing furniture about 20 years ago and moved into full restoration projects with period correct hardware and finishes about 6 years ago. I thought, why not restore speakers? I believe your equipment should look as good as it sounds. I am a very strong believer in keeping things original. I don’t like to let anything leave my hands without it looking and sounding like it did when it was first purchased. A: What’s the most interesting part of restoration? KM: I think the history of the project is the most interesting. When it was manufactured, by whom, the engineers and the philosophy behind the design and of course what led to it’s demise or success. This little hobby has turned out to be quite a project in it’s own right. A labor of love. I have recently hooked up with Steve Hall from Savage Audio, who does all my electronics work, and Midwest Speaker Repair has been making my projects sound fantastic over the years. My wife Jessica does an exceptional job on my website and of course, has put up with hundreds of items coming and going. All she ever asks is which ones are staying and which ones are going. So far, no complaints on what I have kept even if not everything works with a remote! Thanks Kevin! It’s said that “they don’t build them like they used to,” but Vintage Audio lovers can certainly admire the care and craftsmanship that he’s keeping alive. If you’d like to view his listing for Lafayette/Goodman system featured in the slideshow below, click here! For more information about his process and other projects, you can also visit the website his wife Jessica lovingly maintains.